A mother holds her newborn baby close. 3 Are There Natural Remedies to Get Rid of Wrinkles on Forehead? The first months after you have a baby are a busy and exhausting time. With all of a newborn’s demands, it can be difficult for Mom to find time for proper skin care. However, skin problems are not easy to hide. After delivery, hormone fluctuations can cause a variety of skin issues -- from acne to blotchy discolorations. There are a variety of ways to include both external and internal skincare in your busy schedule. Wash away excess oil to prevent acne on your face. Cleanse your face twice a day with a mild cleanser, using your hands or a soft washcloth. 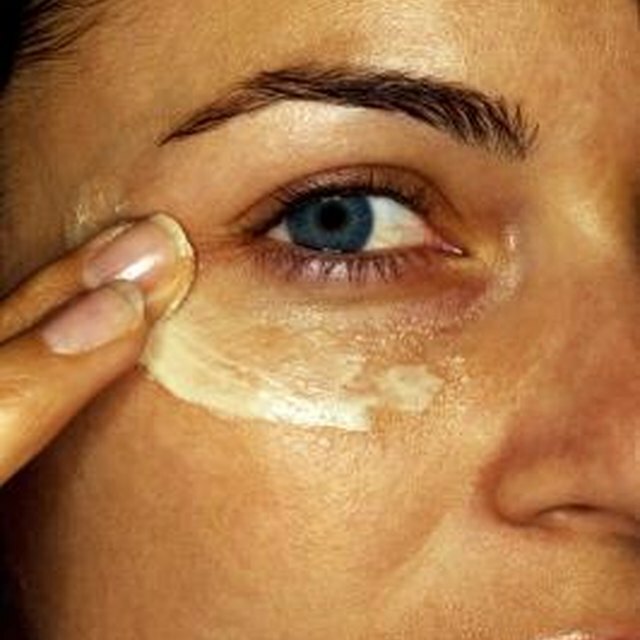 Apply a water-based moisturizer after washing if you have dry skin. Apply vitamin E oil, olive oil or cocoa butter to reduce the appearance of stretch marks. Avoid stretch mark creams with unfamiliar ingredients, because they can be dangerous if you're breastfeeding. Take a multivitamin to make up for any nutritional depletion during pregnancy. Skin needs adequate nutrition -- especially the skin of mothers recovering from childbirth. Find a multivitamin with vitamins E, C, A, zinc and selenium. This is especially important for breastfeeding mothers whose nutrients are often exhausted during feeding. See your doctor if you experience symptoms or skin issues that worry you. He may be able to prescribe a cream or medication to alleviate problems. In addition, laser therapy can be used to treat many skin ailments. Occasionally, skin problems -- such as dark patches -- can signal a medical condition like underactive thyroid. A doctor can perform a blood test to check for any underlying conditions. What to Expect: Postpartum Skin Woes -- Where'd That Glow Go?